Extreme corruption, inflation, mass famines, immigration crisis…the list goes on. Subsequently, the United States, Canada, Colombia, Paraguay, Brazil, Chile, Argentina, Colombia, Costa Rica, Honduras, Panama and Peru have successively announced their recognition of the Venezuelan opposition leader Juan Guaido as the interim president of Venezuela. Although China, Russia, Iran and other countries claimed to support Maduro, it is clear that the time he will remain in power has come to an end. Through non-violent means, the Venezuelan people bravely expressed their hope for the arrival of democracy and freedom and dramatically changed Venezuela’s political landscape, as well as won support from the international mainstream society. This is another example of how people attempt to utilize Color Revolution to restore freedom, justice, and the rule of law—the universal values that are fundamental to protecting human dignity. Color Revolution, also known as Flower Revolution, refers to a series of political movements that began in Central Asia and CIS countries in Eastern Europe in the 1980s and 1990s, all of which intended to overthrow authoritarian and tyrannical regimes through non violence. Participants embraced liberal democracy and universal values, they hoped to resist the rulers through non-violent means and bring political change. They often used a special color or flower as a symbol of their movement. At similar public security meetings over the past few years, the CCP always emphasized the old-fashioned topic of “maintaining national security.” Why did Zhao Kezhi start to emphasize resisting the “Color Revolutions” all of a sudden? It might be due to the fact that the CCP’s tyranny has caused anger among the entire Chinese people for decades. Its regime has been faltering and might collapse at any time. It is fearful of the occurrence of any “Color Revolution” in China and thus decided to focus its domestic police force on defense against such movements by common citizens. This is a manifestation of its final effort to stay in power. As many political commentators have pointed out, looking back at history, since the CCP started ruling China, whenever the number “9” appears in a year, that year was always chaotic: the Great Famine and suppression of Tibet in 1959, Zhenbao Island incident in 1969, war against Vietnam in 1979, Tiananmen Square Massacre of students in 1989, the suppression of Falun Gong in 1999, the suppression and mass internment of Xinjiang Uyghurs in 2009, and so on. It is widely known that Venezuela is one of CCP’s most important allies. 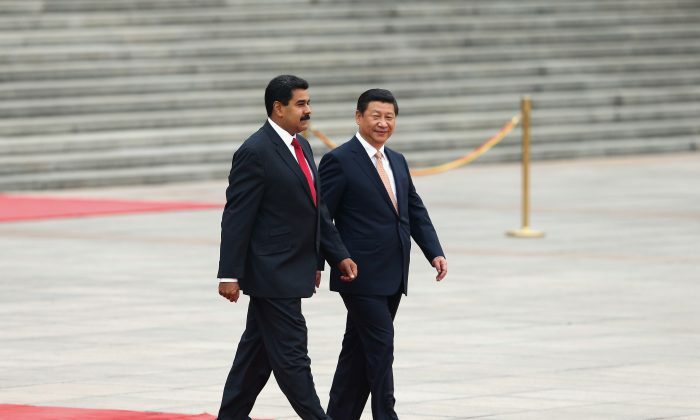 At the beginning, the CCP decided to establish a cooperative relationship with Venezuela because of two primary reasons: On the one hand, it wanted to import oil from Venezuela to fill a potential gap caused by the failure to import oil from Iran. On the other hand, by helping Venezuela develop its economy, Maduro can continue to obstruct America and the Trump administration. The CCP would possibly have never thought that its new investment agenda has essentially failed. Flora Yan is a junior at the University of Washington in Seattle double majoring in political science and communication. She is conducting research related to the impact of propaganda on public opinion and public policy; the role of propaganda in totalitarian countries; and the connection between human rights and foreign policy. An aspiring China observer, she is particularly interested in human rights issues in China.